T-Mobile stores are starting to receive dummy models of the Samsung Exhibit II 4G which means that the device formerly known as the Ancora may be hitting shelves in the very near future. Overseas the Exhibit II 4G was known as the Samsung Galaxy W. It is a mid-range Android smartphone that boasts some solid specifications. On top of the Android 2.3 Gingerbread platform Samsung will have their TouchWiz user interface. 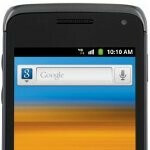 The Exhibit II 4G features a 3.7-inch screen display and is powered by a single-core 1.4GHz processor. Not too shabby for a so called mid-range device. Since the dummy of the smartphone is arriving at T-Mobile stores it must be getting ready to go on display. Odds are the release of the Samsung Exhibit II 4G is just around the corner. Considering it is a mid-range device it may be blessed with a mid-range price tag that might be very enticing considering all that it has to offer. Tell us what you think of the Samsung Exhibit II 4G. Just shut the f**k up ok. O wait pa will ban you anyway. Iphone has what price point? Doesn't matter what it is! It sells well even at $1000 or more. Wake up tmo and all its fanboys! When it comes to technology, consumers nowadays want the best. Grammas and grampas are using ipods and ipads. Get with the times.